United to Start Flying from San Francisco to Singapore! This is huge news! 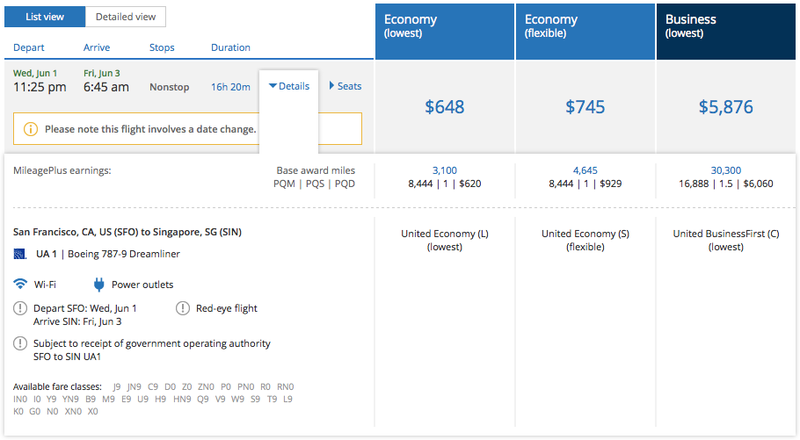 You won’t have to wait until 2018 to fly nonstop from the US to Singapore — United just announced that it’s launching a new flight connecting San Francisco and SIN on June 1, 2016! The new flight will operate daily, with the inaugural departing San Francisco at 11:25pm on June 1 and arriving at Singapore Changi at 6:45am two days later. On the return, the flight will depart SIN at 8:45am and arrive at San Francisco at 9:15am, so it’ll be possible to make connections throughout the US in both directions. The early morning Singapore departure may make Southeast Asia connections difficult without an overnight in Singapore, but there are certainly worse places to spend the night. The new flight will be operated by United’s 787-9 Dreamliner, with 48 lie-flat seats in business, 88 seats in Economy Plus and 116 regular economy seats. All of the airline’s 787-9s are equipped with seat-back entertainment and Wi-Fi. The flight is scheduled for 16 hours, 20 minutes on the outbound and 15 hours, 30 minutes on the return. Availability for the inaugural flight. Round-trip fares from San Francisco appear to run around $900 in economy or $4,700 in business. You may be able to save a bit by flying from another city and connecting at SFO — economy flights from Newark will run you about $850 round-trip, for example, which is a relative steal for a 22,000-mile journey. United has loaded some economy awards, but business-class award seats are not yet available. You’ll need to redeem 80,000 miles round-trip for economy or 140,000 round-trip for business class. Given the relatively low economy fares, however, you’ll probably be better off paying cash. As part of this announcement, United shared that it will discontinue service between Tokyo and Singapore on June 2, though ANA operates United codeshare flights on that route, and Singapore Airlines operates Narita service as well.